One day, I will either figure out how to use WordPress consistently or get a tutor. I’m sorry that you need to view two pages to get some of the photos. You can see that we are all hanging on to the wobbling sticks that are keeping us on the cart as it rolls over the rocks and branches in this dry river bed. At times I felt as though I were on a sailboat on a rough sea. Incidentally ten years ago this river was a rushing flood plane that washed out homes and killed 20 people. We passed a couple remains of walls on this part of the trip. Owners of the two farms that we visited lost their homes but not their lives and therefore moved higher up the mountain/foothills to begin life anew. The photos are more of the Community Integration Adventure. The Feast is in Limón #2 at the end of the Adventure. Thank you for your patience and hopefully you will share the joys of life with those around you. English translation: Remember Nicaragua – This is my land! It may be difficult for some of you to understand, but I do feel that Nicaragua is my country. I feel more at home here than I feel in the USA. Yes, I miss my family and my friends. My hope is that you all will come to visit me someday and feel the warmth of the people as well as the temperature. The past six weeks has presented some exciting adventures for me. First I must admit that I had almost two months of “party time” since there were a lot of friends here for their vacations in January, February and March. Now almost all of these friends have gone back to their homes in cold country leaving just a few of us “live here” expats. This doesn’t mean that my life slows down however. Next week, April 9 to 11, I am involved with organizing the Aproquen Children’s Burn Hospital three day Burn Prevention program for four schools in Rivas Department and ending with the 8 hour seminar for medical professionals on “How to Care for a Patient Within the First 24 Hours”. 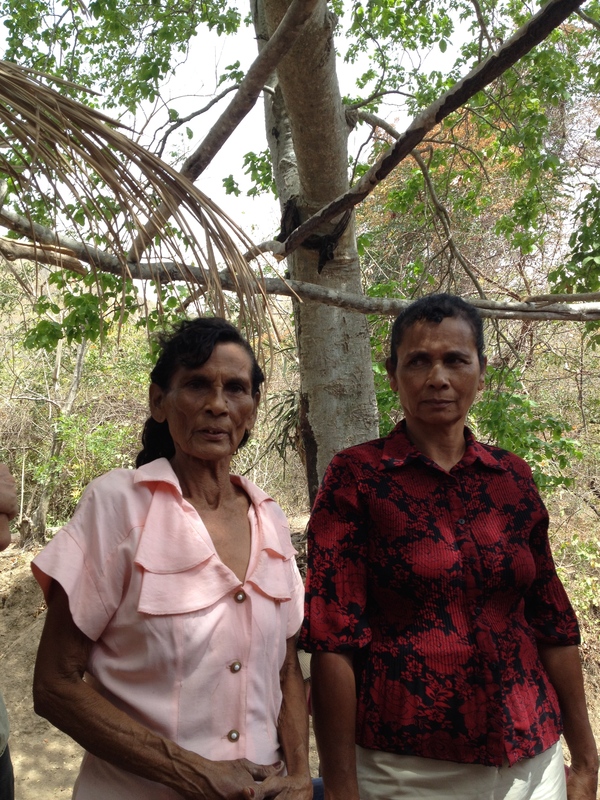 Aproquen had not done any programs in Rivas until the one that I organized last year here in the rural Tola area. This year Aproquen will be presenting in the city of Rivas. I am blessed once again with some great local helpers who tolerate my terrible Español and get me to the exact person or place that we need. 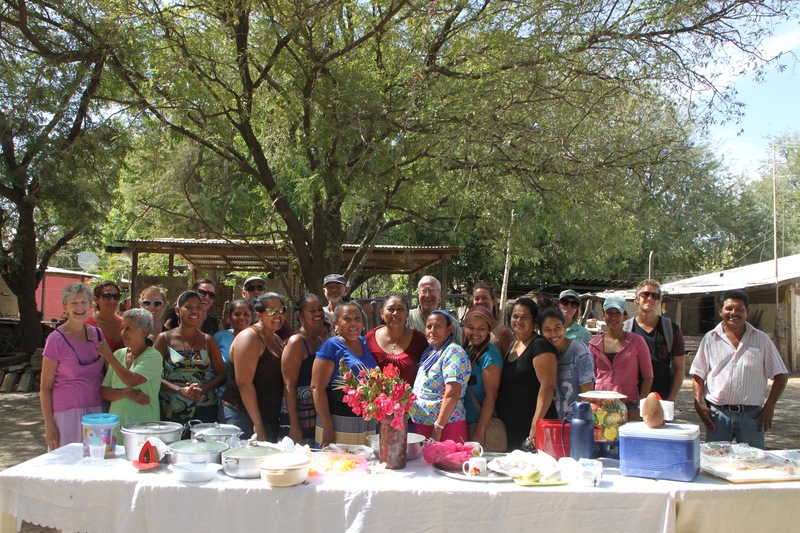 This year the 17 person team will be staying at Convento Sinai, a Catholic conference ground just north of Rivas that is run by two nuns and a couple of families who live there. The cost of the rooms–two persons per room–is a little over $7 per night including dinner and breakfast. 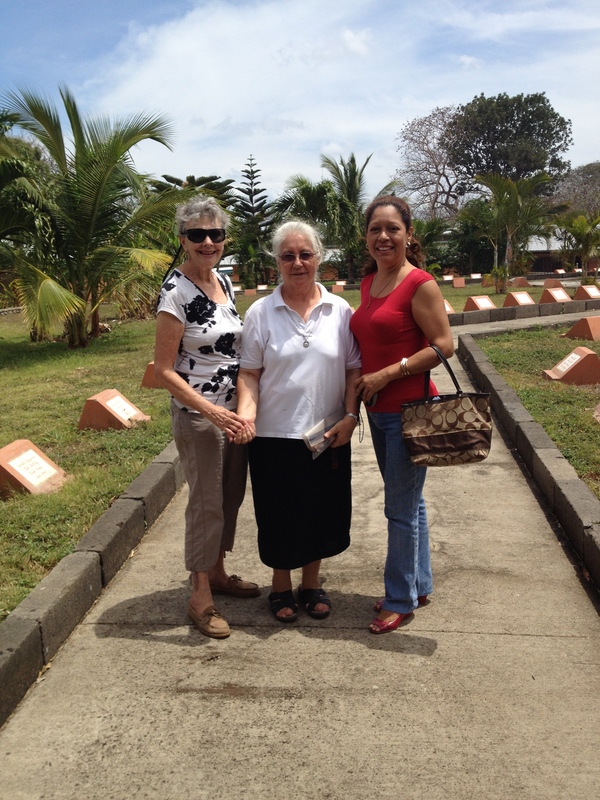 I am including a photo of Sister Pilar, a helper friend, and I at Sinai. The Rivas Hospital has a classroom with all the electronic equipment that we need. The Director Doctor Cortes signed up more than half of their staff for the seminar on Saturday. Hopefully I will get the help I need to transport all of the program items–books, crayolas, drinks, cookies, piñatas–from Aproquen in Managua to Rivas before Thursday when the programs begin. Last year it took two vans and we stored the stuff in my little house. This year, we can store the items at Sinai for one night. You can see Aproquen at: http://www.Aproquen.org. For the past two weeks I have been working hard on getting a US visa for a mother and child who will be traveling to New York to obtain treatment and possibly an arm prosthesis for 8 year old Hengel–pronouced Angel. 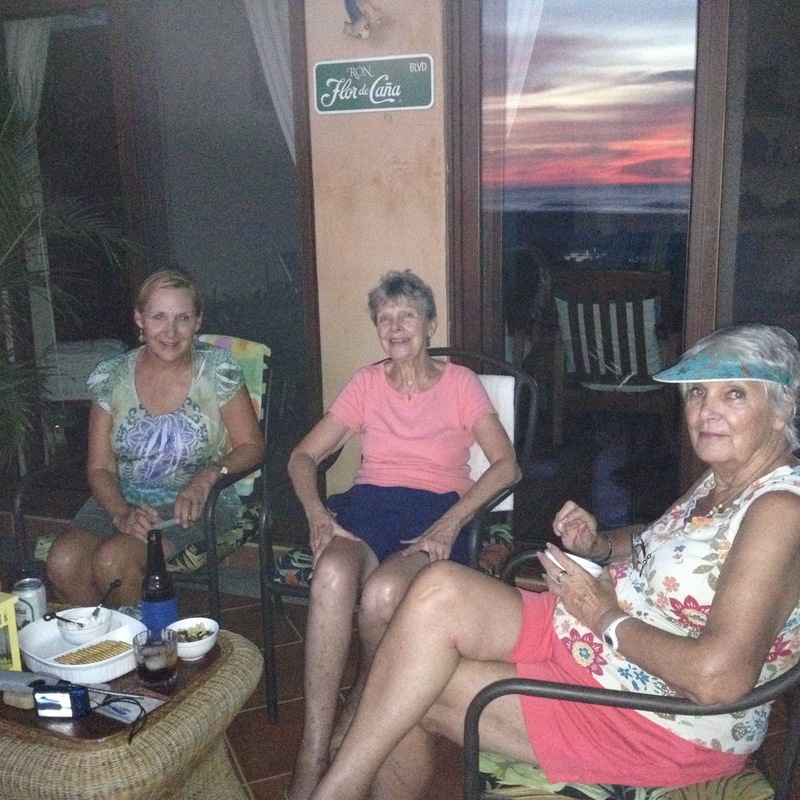 Hengel’s mother works at Rancho Santana as a cleaning lady for the restaurant. I met Hengel last year when we presented the Aproquen program at his school in Las Salinas. He was one of the four Baile Folklorico students who put on a cultural program for us prior to our Burn Prevention program. Dra. Ivette Icaza remembered the name of a US organization that worked with children who were dedicated to making something of themselves by providing medical treatment and prostheses–Global Medical Relief Fund (GMRF http://www.gmrfchildren.org). I contacted GMRF and now, almost one year later, Hengel and his mother have an appointment with a doctor at Shriner’s Hospital in Philadelphia for Hengel’s first appointment on May 20 at 8:30 am. I will include a photo of Hengel. He is a sweetie and his mother is truly dilligent in getting passports, now visas for the two of them. The statement, “It takes a village” is real here. Hengel’s Mom, Yajaira, makes $200/month. She and her husband have another child so they never have money to spare. Yajaira’s boss at Rancho Santana has been very supportive in allowing her the days off that she needs to go to Managua to get their passports, visas, and next step US Embassy appointment to obtain the visa. I spent six hours on Wednesday filling out the DS-160 form for non-immigrant visa and finally gave up. Since this week is Semana Santa nothing is open anyway and I will go back to the task tomorrow. They need the visas scanned before GMRF will make a plane reservation. May 20th is looming on my radar. A major adventure is the new business in which I have become a partner–Proyecto Esperanza, S.A. We currently are selling high quality biodegradeable bags that are manufactured in India with jute made to our specifications. In the future we may add more products or parts to the business. We have inventory here in Granada, Nicaragua and in Baltimore, MD. We are interviewing potential distributors for an online business in the US. Anyone interested, get in touch. Nan Zinn, my partner, and I have decided to use the name of the existing corporation that she had rather then creating the paperwork for Dos Hermanas, the company that I had begun but didn’t finish the paperwork. Good news is that I got the clear title to my commercial property in Limón #2 this week so Nan and I can use that land for the business in some form or another. Three weeks ago Saturday, I went with a group of 12 others on a tourism inquiry adventure to the area of Cuascoto. The objective of the adventure was to cooperate with community leaders in some of the surrounding villages to give cultural integration tours for folks who would choose such an adventure. Our tour was one of ten tours that took place over ten days. At the end of the tour we had to fill out a survey about our experience. I have to say that, although I had a great time, this tour would not be for the weak hearted. 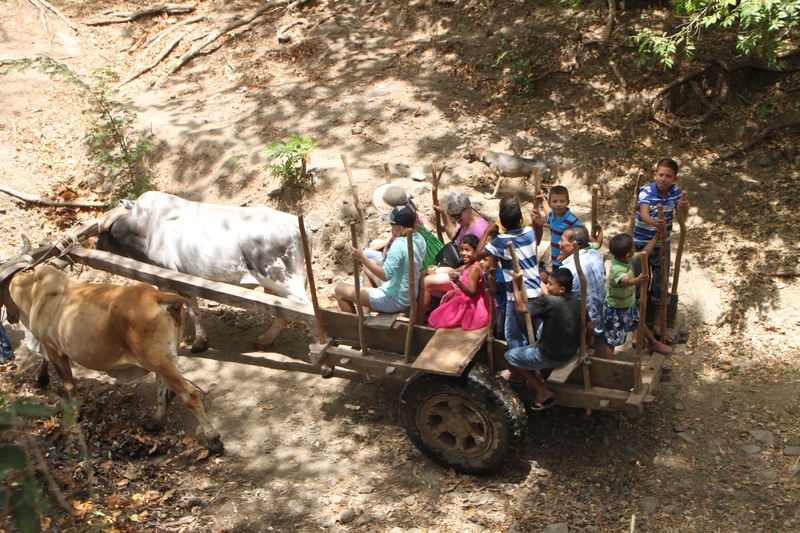 We traveled up the foothills in a 12 passenger van until the road–if you want to call it that–ended at the first finca (farm). We toured the farm which was very clean and organized, in fact the house was much better than the family houses where I used to live. We then walked about another football field in length through a couple of barbed wire fences and then divided up and climbed into two oxen driven carts. This procession progressed further up the foothills for another 20 minutes to another farm that is owned by the 82 year old mother of the first farm woman. I’ll include photos of the two of them as well as the ox cart. 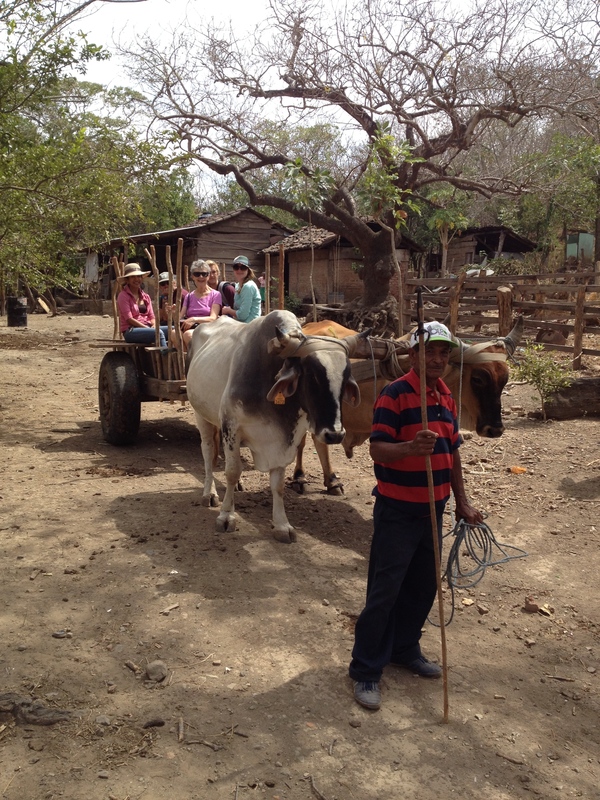 Our trip lasted for five hours culminating in a typical Nicaragua food fest presented by the community leaders of Limón #2 where I used to live. This luncheon was actually adjacent to my commercial property, so I could gloat a little about owning the land next door to my tourist integration group. The day was exhausting; I was so happy to get into a hot shower at the condo when we returned in mid-afternoon. But it was definitely a fun adventure for me. The weather here is tolerably warm as the winds are still blowing to keep it from being too hot. We desperately need rain in our area as in CA so get the prayer wheels a turning. There are many families here at Rancho Santana for Semana Santa. Most of the folks are Nicas who either own homes here or who can afford the prices of the rental properties. Semana Santa is a big week in Nicaragua as in most Latin countries. It seems that everyone heads to the water to be cleansed in one way or another. I put on a swimsuit and got into the ocean yesterday–first time in four years. Thought I could use some cleansing too after the unkind thoughts I had about the US Embassy and their awful computer systems that didn’t accept my data and the Embassy person who I finally talked to on the phone who told me to redo everything. That is when I decided to stop and have a beer–micro brewed by a young man here at Rancho Santa–coffee stout. Easter Sunday will have to be minus my usual Easter Bread since I don’t have coffee cans here to bake it. I am having brunch though for six of us and will make Eggs Benedict. We have a great mixture of community. One couple who are coming are from Kenya. They owned the Giraffe Inn outside of Nairobi and sold that last year to come here. I am grateful to be a part of all. As you can tell, my sign that has hung on the walls of my houses for 11 years is an accurate statement. This is my land.